Yesterday, I participated in a protest rally in support of two transgendered women, Leslie Mora and Carmella Etenne, who were brutally attacked during the past month in the borough of Queens. 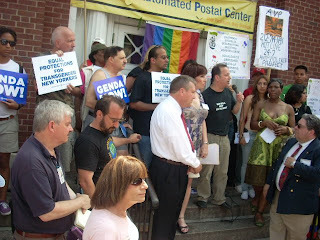 The rally, organized by local LGBT leader Brendan Fay, drew other LGBT leaders such as Melissa Sklar, openly gay City Council candidate Daniel Dromm, plus City Councilman and Public Advocate candidate Eric Gioia. All voiced their ongoing support for an end to violence against transgenders, gays, and lesbians. Other important speakers inclided FIERCE founder and transwoman Julienne "June" Brown and representatives from Make The Road, a Bushwick LGBT-rights organization. Thanks to DJ Baker, here are videos of some of the Rally speakers, and their important message to STOP THE HATE, NOW! Stay tuned. There will be more on this developing story later today. Thanks to all who came out to help end the senseless violence against our LGBT community. Things To Come Reflected In The Past? My interview on "Maurice Runea: The Show"
Living Room Sessions III Tonight at Red Bamboo!